I am quite sure that those of us who grew up on a steady diet of James Bond films would have seen the many kinds of amazing technical wizardry that the British superspy was endowed with, where we would have killed to be in such a position in real life. Imagine having suave good looks, fantastic gadgets to play with, and of course, a license to kill in the name of national security. It seems that what was once deemed to be fictional is now a reality in the form of the $135,000 Amphibious Car, which has been touted to be the fastest of its kind in the world. 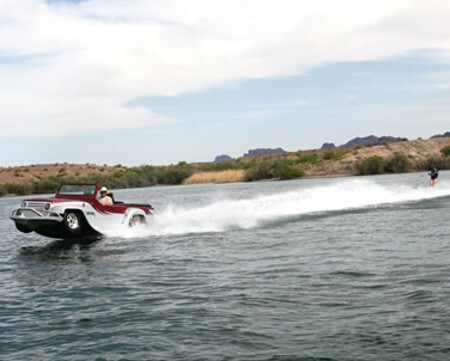 The self-proclaimed “World’s Fastest Amphibious Car” is no slouch when it is in the water, where it is more than capable of speeding on such a surface at 44 mph. Should you still fail to shake your enemies from behind you and have already made your way to the asphalt, then fret not, as this ride will be able to hit a stride of 80 mph on the road. Underneath the hood of the Amphibious Car lies a 300-hp Honda engine, where the entire shebang works like a standard vehicle on land thanks to its four-speed manual transmission, four-wheel disc brakes, lights, turn indicators, and a folding windshield. Should you find a need to enter the water, an integrated hydraulic wheel retraction system will raise the wheels above the bottom of the hull. Sounds like a dream ride to many of us, no?